Charles Summers was, apparently, a son of David Summers and Mary "Polly" Horn. David was one of the five sons of John Summers Esq. of New Jersey, and David died in NJ in 1825. His widow, Mary, removed with her four children to Michigan in the 1830s when the most of the other New Jersey Summers decided to relocate. 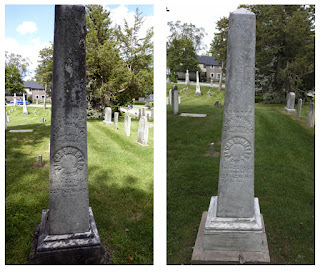 We have known, or thought we've known, that Charles Summers married Laura Tower, mostly by virtue of her gravestone in Michigan which states her maiden name. But recent correspondence from a Tower researcher has lead us to realize that Laura was probably the second wife of Charles Summers. We have located the marriage record of Charles Summers to Laura Gibbs in 1839 in Michigan (see familysearch), which seems to suggest that Laura Tower was previously married to somebody with the Gibbs surname (we don't know who). But it also appears from the 1850 census that there was a son in the Charles Summers household named Samuel who was born in New Jersey. This would mean that Charles Summers probably also had a first marriage in New Jersey. And as long as we're on the topic of Charles Summers, it is worth noting that he is the one and only Summers who has SOME connection to the surname LONGSTREET. The Longstreet surname has long haunted us, because when I first started this Summers research, every crowd-sourced family tree out there claimed that my 6th g-grandfather, Georg Sommer, was married to Anna Barbara Longstreet. This claim is very widespread, but after years of hunting, I can find no source other than DAR/SAR applications. What the documentation does support is that Georg Sommer married Anna Barbara Rub in Freistett, Germany and they had several children prior to emigration to America in 1752. Georg died in NJ in 1785, and perhaps Anna Barbara remarried to a Longstreet, but so far, I've not found any documentation to support that idea. I generally like to keep the content of my posts to the details of the families I'm researching, my research process, and my findings, and not so much about general genealogy topics because I figure people can find that information in other places. But this fall while participating in a study group about the genealogical proof standard, the word "provenance" came up in several discussions, and that was a new one on me. I trust that others can still look up what this term means in genealogical context, but I thought I could share here what it means in relation to our Sommer research. As previously posted in "Sommer Originals," I have located several original documents pertaining to the Moreland Sommer branch of our family. But I was feeling uncertain about how to cite that information "officially," so I wrote to Elizabeth Shown Mills, the author of Evidence Explained, via her website. You can read my questions and her answers here. The materials in the Longwood Manuscripts, Group 8, were materials acquired by Pierre S. du Pont (1870-1954) through either purchase or gift. All of the other materials in the Longwood Manuscripts are items he inherited from various family members. P.S. du Pont was known as an avid collector of materials concerning the du Pont family, DuPont Company, and the explosives industry in general. Many of the items in the Longwood Manuscripts, Group 8 and other collections in our library were originally acquired through his collecting. Specifically, for the Potts materials, his source is listed as “Unknown Source”. So, unfortunately, we have no way of knowing where P.S. du Pont acquired these papers. And there we have it, the provenance of our precious original papers pertaining to the Sommer family. How in the world did DuPont end up with the scrapbook of Howard Newcomb Potts, 1819-1906? Potts, who had no children, left quite an extensive estate to nieces, nephews, and charities. I've looked to see if there were any obvious connections between Potts' nieces and nephews and the DuPont family, but I haven't found any yet. I imagine that DuPont acquired these papers almost accidentally, i.e., they were part of something he inherited from some family member, which then remained in his collection even though their subject matter was not his primary focus. Well, if anybody has ideas on this one, how to tie the scrapbook of H.N. Potts to Pierre DuPont, I would appreciate hearing from you. Otherwise, I'm going to have to lean on a lot of logic to make the case that these papers do, indisputably, belong to our Freistett Sommer family. It seems obvious, but this business of proof can be a challenge. As the end of the year approaches, I realize I am still sorting through all the information garnered from the flurry of my Sommer research this year. So it's a good time to belatedly report on a highlight of my research adventures in 2015, and that was a visit to the Hagley Library in Wilmington, Delaware in late July. In case you're wondering how I ended up in Delaware, I suppose I have google to thank. Awhile ago, I found a partial index on google books, you know the snippets that tantalizingly don't show you the whole book but just a sentence or two? The book in question gave hints about Jacob Sommer, but said book can no longer be found, no library within a 1000 miles has it, etc., etc. So it took some research on that source alone to find that the material being referenced in it currently resides at the Hagley. It took nearly a year of me writing emails and finding a local researcher (a friend) to go there and make a copy of some things from that collection. What he sent me was enough for me to add the Hagley to my travel list. And boy, was it worth it! First of all, the Hagley is located on the most beautiful grounds in the most beautiful old yet modernized building I've ever worked in. What an absolute pleasure. Second, the box that got delivered to me in the research room was full of original documents written in the 1775 era, most of which had everything to do with our Sommer family of Moreland. This might be one of the few times I can recall having a swooning sensation while doing genealogy research. On 18 Jun 1823, the Democratic Committee of Arrangement wrote a letter to Jacob Sommer Esq. informing him that he had been unanimously appointed to read the Declaration of Independence at the celebration of the 47th anniversary of the national independence. In 1823, Jacob Sommer was himself 65 years old. His parents had been German immigrants who had resisted the British through the days of the Philadelphia Campaign. Jacob, having joined the PA militia, had been captured by the British and held prisoner on Long Island for four years, and then returned home to become a PA state senator and later an associate judge. He had written and delivered addresses that expressed the passion of his belief in national freedom, and he continued to stay active in politics until the end of his life. Jacob Sommer had defined himself as an American Patriot. Given that the family line of Jacob Sommer ended with his grandchildren, there has been nobody to remember this part of our Freistett family history. But now, thanks to technology and spirit of preservation held in places like the Hagley, we can know and appreciate a legacy that is now ours to proudly pass along. The inheritance customs in Germany at that time were for the oldest son to inherit, leaving all younger siblings to make their own way. I therefore assumed that Matthias Sommer had inherited whatever there was to inherit, he stayed in Germany, and the younger brothers subsequently left for America. The list of names on the ship Brothers, which arrived in PHL on 22 Sep. 1752, did indeed include only the three younger brothers - no Matthias - thus supporting my probably-wrong assumption. Georg and Barbara Sommer's first child born in America in 1753 was sponsored by Matthias Sommer, Margareta Haas(in), and Christina Sommer(in). So right out of the gate, there is the name of Matthias in direct relation to our family, and whom we have not previously accounted for. Second is the appearance of the surname HAAS. The progenitor of all these Sommer brothers was Matthias Sommer 1690-1732 who married Anna Barbara Huebscher (surname spellings vary). Anna Barbara remarried to one Mathaus Haas in Freistett in 1733. Whether there were any more children from this second marriage is unknown, but you can see why we should have an interest in the HAAS name. I thought it reasonable to assume that the Martin Sommer mentioned in Jacob-Moreland's will was related in some way to Jacob and to the Freistett clan. This assumption COULD BE INCORRECT, but I decided to start with the idea that was true. So if the mentioned-Martin was indeed related to Jacob-Moreland, how is it that I can find no Martin Sommer of the Freistett clan who was alive in 1823 when Jacob-Moreland wrote his will? I finally remembered the oldest Freistett Sommer brother, Matthias, and when I looked at the known children he had in Freistett, I found that his oldest child was named - wait for it - Martin, born 1737! So if the oldest brother, Matthias, did come to PHL before the other brothers and he brought his German-born children with him, then....? Indeed, the StM&Z church records did show a number of records for a Martin Sommer and wife, Maria, who were having a number of children starting in the mid-1760s. And lo, the last record I find among the American-born children was Martin Sommer, born 1772. All of which leads to a Martin Sommers who recently bubbled to the surface in my recent records search. He showed up in censuses, in Orphan's Court records, and even in the book by G. Byron Summers. This Martin Sommers lived in Oxford Twp., PA and died in 1824. If indeed the Martin Sommer noted in the previous bullet as having been born in 1772 in PHL was the same person as Martin Sommers of Oxford, then he was the grandson of Matthias Sommer of Freistett, and he was both related to Jacob-Moreland and alive in 1823 when Jacob wrote his will. When did Matthias Sommer come to PHL? Was he married? Did he bring his German-born children? When and where did he die? Who was Matthias' son Martin, born 1737 in Freistett? Who was the Maria he apparently married? What happened to the other children from that marriage? When and where did this Martin die? Then there is Martin-Oxford. According to G. Byron Summers, this Martin married Sarah Copart, and a number of descendants are listed. Was it really Sarah he married? And what of all the descendants? See what I mean about the Freistett story just got much bigger? We Freistett descendants should all be going back to look over any DNA matches again. There could well be many, many more Freistett Sommer relations in America than we have realized. As we know, I have been interested in rounding out the story of the Sommer family of Freistett, Germany who arrived in PHL in the 1750s. The youngest brother to arrive was Martin Sommer, born 1729 in Freistett, which means he was about 23 years old when he arrived in PHL. Based on Communion records at StM&Z, it appears that this Martin remained unmarried until the early 1760s when baptism records begin to appear for Martin Sommer and his wife, Maria Margaretha. Unfortunately, we still don't know who Margaretha was, but according to the church records, a couple named Martin and Margaretha, presumably this couple, had 10 children between 1764-1784. Among those children were two sons, one named Martin and one named George, who, it appears, both worked as blacksmiths in Philadelphia - but more about the sons later. In this post, I want to focus on Martin Sr. and some interesting details that emerged recently about him. First, after all my recent research on Jacob Sommer of Moreland, and his father, John (Johannes, one of the three brothers to emigrate from Freistett), I am inclined to associate Sommer/Summers surnames in Moreland with the Freistett clan. Indeed, we find there was a Martin Sommer on Moreland Twp. tax lists for J. Northrop's estate between 1767 and 1780. There was also a Martin Sommer in Northern Liberties tax lists for George Bender's estate between 1779-1787. In the 1780 tax list, Martin was noted as "Smith". I take this to mean our Martin Sr. was, himself, a blacksmith. Interesting! But where was this Martin Sommer in 1790? The only one I found was in downtown PHL, and there I made a discovery. This 1790 census of PHL listed the address of each person enumerated, and for Martin, it was #46 N. 7th St. For some reason, both familysearch and ancestry indexed this as an enumeration of Water St. East, but if you look at the previous page of this enumeration, it says 7th St. from Market to Race Sts. East. Sure enough, in the PHL city directories for 1791, 1793, and 1794, we find a Martin Summers at that address with occupation as laborer or carter. In the 1800 directory, there is no longer a Summers listed at that address. So why is this significant? The 1799 burial record of Martin Sommer from StM&Z recorded not only his age at death to the year and month, matching the baptism record we have for this Martin in Freistett, but also that he was living at 7th and Arch Sts. when he died, which is pretty much the address we see in the 1790 census. In fact, this location is also close to the U.S. Mint, and I would almost worry that we have some how mixed up Freistett Martin with H-W Martin, 1740-1804, who is the one we've associated as having worked at the U.S. Mint. But H-W Martin left a will that mentioned both his wife, Anna Barbara, and his Mint job. It can also be noted that the 1806 and 1807 PHL City Directories listed Mrs. Summers, widow of Martin, at 131 Cherry St., which would have been after the death of H-W Martin, and was also very close to the Mint. So the proximity of the Mint to the address in this 1790 census is seemingly a coincidence. But now we get to the really good part. Thanks to another Sommer researcher whose knowledge of old PHL is fantabulous, I learned that "On the corner of 7th lived the famous David Rittenhouse in his mansion. Next is Martin apparently renting from Rittenhouse (so says the 1798 Direct Tax List). The next person up the street is Eliza Sergeant who is a widowed daughter of the Rittenhouses. The modern day analogy here is that Martin living in Rittenhouse's back yard would be like living at the back of Stephen Hawking's house!" The 1798 tax list actually shows Martin was renting from the Rittenhouse widow, David's second wife, Hannah Jacobs, which rang a bell. During my recent research trip to SLC, I had looked up the will of Catharina Wolff Menge (wife of our Ernst Menge's brother, John), who died in 1795. Her will mentioned that she (??) had purchased a plot of ground from John JACOBS situated in Kensington, Northern Liberties. Was this the same John Jacobs, a brother of Hannah Jacobs Rittenhouse? "John was the last speaker of the assembly before the revolution, and of him Benjamin Rush reported that he has been in favor of a Republican form of government for twenty years before that time." (from "Bebber’s Township and the Dutch Patroons” page 4). The other name that jumps out is SERGEANT. We have a letter written from a John Sergeant in PHL to our Jacob Sommer, the PA state senator, and indeed this John Sergeant would himself later become a US Congressman. This John Sergeant was the son of Jonathan Sergeant and Margaret Spencer. After Margaret died in 1787, Jonathan Sergeant remarried to Elizabeth Rittenhouse, the daughter of David Rittenhouse, the mathematician! My goodness, look at all the almost-connections! I have looked and looked for some connection between any of the known daughters of Martin Sommer and Rittenhouse, Jacobs, or Sergeant, but so far, nothing. Who knows, maybe the connection was through Martin's wife, Margaretha? Otherwise, the best I can figure at this point is that Martin Sommer Sr. was somehow acquainted with these PHL families via his nephew, Jacob-Moreland, and was being employed in some capacity. But to be honest, I'm sure the Rittenhouse family had any number of employees, and yet the name of Martin Sommer appears on its own. Curious, eh? Georg Sommer, the elder, lived in Oxford, NJ and has long been credited as being the Ensign in Capt. Mackey's company (First Regiment, Sussex). I never questioned this until I realized our understanding of Georg's obituary had been incorrect (click here for more info), and that Georg had suffered from cataracts for 11 years at the end of his life, leaving him blind. This would mean in 1776, he was 54 years old and having sight problems. For this reason, I tend to think that the man from Oxford who served as the Ensign for the New Jersey militia in 1777 was instead the son, George Summers, 1747-1825, who later moved to Bucks, PA.
John buried his deeds when the British took over Philadelphia, and when he later dug them up, they were so damaged, he had to address the PA Assembly to have his lands recognized again. John's only surviving son, Jacob, an Ensign in the PA militia, was taken prisoner and held on Long Island for four years; Jacob would later become a PA State Senator. I have not yet found any indication that Martin Sommer served in the Revolution, and his sons were too young at that time to have served in the military; research is ongoing. George Summers Sr. was older and going blind at the time of the Revolution - so he likely never served in any military unit, though this point could still use more study and discussion. George Sr.'s son, George Jr., had only one son, John, who died in 1791 - so even though we know that George Jr. did serve militarily, we also know he did not have descendants to survive him. The good news, in my opinion, is that it's not our association to Revolutionary Patriots that really matters. I consider all these Sommer ancestors Patriots because one and all, women and children included, they participated in a collective desire for freedom which changed history, and continues to influence some of our deepest-felt values today. So thank you to all veterans of military service and their families for embodying the struggle of so many to lead better lives. On Veteran's Day and every day, thank you. I dedicate this post to the memory of my father, Major Richard C. Schaefer, USAF, 1933-2009. He did love history. The research on Jacob Sommer of Philadelphia really picked up this year, especially after a member of the Northeast Philadelphia History Network took an interest in my blog late last year. Based on subsequent correspondence as well as a visit to the area this summer (with a personal tour of Somerton given by my NEPHN history guide, thank you very much), the story that has emerged about Jacob Sommer has, I think, surprised us all. I'm happy to say that the highlights of this collaborative research now appear on wikipedia - check it out here. In many ways, this story is still evolving, still being discovered, so expect to see updates, which is the glory of the wikipedia model. Meanwhile, the facts we know now give us a wonderful picture of this branch of our Sommer family, who lead such extraordinary lives during a time when our country was just being born. I know I'm supposed to be objective about this work, but sometimes I can't be. I find myself immensely proud of all our Sommer ancestors, and welcome this new story into the rich legacy left for both our family and our country. Update: See my article, Jacob Sommer of Moreland, PA in American Revolution for more details about this ancestor of our Freistett Sommer family. Also see the later footnote posted in this blog. Clifford Mays, who will retire from the Cheyenne County bench in November, is also a rancher. None of the three people nominated to fill his vacancy is a lawyer: One is a school superintendent, one works for a local historical society, and one is a wheat farmer. Because of documentation found in Michigan claiming that Jacob Summers of Macomb was related to a judge Jacob Summers of PHL, I've been doing a fair amount of research in PHL over the past year. The short answer is that Jacob Sommer of Moreland was related to our family, but not directly to the branch that migrated to Michigan. Still, it's interesting to note that the Michigan Summers must have known of their PHL family in order for that detail to have made its way into the family history. But beyond the story, how to connect the dots between Jacob Sommer of Moreland and our family? The death record of Johannes (aka John) Sommer in 1792 identified him as being of Freistett, which connects Johannes to our family. That same death record said that Johannes had only one surviving child, and the only Sommer name that appears next in Moreland records is Jacob. But without any other records to establish relationships, I decided to resort to my backup strategy, which I call "Act As If." In this mode, I move forward, carefully and only so far, as if I know that Jacob was the son of Johannes and his wife, Anna Eva. By the time I got to the grandchildren, Jacob J. and Mary A., I had nearly forgotten that I don't really know if these people belong to my Sommer family or not. But when I looked at the burial record for Jacob J. Sommer, my method found meaning. The burial record shows all the people buried in the Sommer plot at Laurel Hill Cemetery, which included Jacob J., Mary A. and her husband, Howard N. Potts, Louisa M. Sommer (mother of Jacob J. and Mary A. ), and guess who? Johannes and Anna Eva Sommer, who were moved on 12 Oct 1874 from 5th and Cherry Sts. St. Michael's was built 1743-1748 at 5th and Arch St. and was the only Lutheran church in the city of Philadelphia until Zion Church was built at 4th and Cherry in 1769. By 1751 two pastors served the congregation and also served Zion when it was built. During the Revolutionary War St. Michael's was used as a garrison church by the British who allowed the Lutherans to use it at times; Zion was used as a British hospital. Both churches had to be rededicated after the war. In 1868 the lot on which Zion was located was sold and the congregation moved to Franklin and Race. In 1874 St. Michael's was sold and the congregation moved around until the 1900s when there was an apparent merger of both churches. St. Michaels-Zion Lutheran Church is located at 228 North Franklin Street (1980). But not so fast. Apparently the above description is talking about the church, but not necessarily the cemetery. I can't find specific sources, but information found on message boards says that around 1861 most of the bodies in the cemetery of StM&Z were moved to Lehigh Ave. between 31st and 32nd. However, some remains were left behind only to be rediscovered when the U.S. Mint was built at 4th & Cherry Sts., which still stands today. All I can think is that when the StM&Z cemetery was moved in 1861, Johannes and Anna Eva were among those left behind. But when St. Michael's church was itself sold in 1874, the descendants decided to move the great-grandparents to be among family. All of which has brought me full circle. I have the 1758 StM&Z baptism record for Jacob, son of Johannes Sommer and his wife Anna Eva. I have the paper trail that leads from Jacob to Dr. John to Jacob J. and Mary A. And now we can see that Johannes and Anna Eva were moved from StM&Z cemetery to the burial plot of their great-grandchildren. It's a little more than connecting dots, I think. It's about claiming the remains of the original immigrants for this branch of the Sommer family. How was Jacob Summers 1787-1864 related to Jacob Summers 1808-1885? The older man was a Michigan state legislator, who was also involved in banking, agriculture, and civil service. Two local histories as well as several newspaper articles referred to him as Uncle Jake. The younger man was mostly a farmer, and was also involved in local civil service. Deeds, court cases, and even his own will use the suffix "2d" after his name. So, hmmmm. Maybe the answer to the question has been staring us in the face. I have been taking the familiar name of “Uncle Jake” to mean that the public somehow saw the older Jacob Summers as a kind and wise gentleman - and how my brain came up with that association, I'm not exactly sure. What I've learned in researching the older Jacob is that his reputation was instead one of being rather eccentric and rough around the edges. So why was he called Uncle Jake? This would be one of those AHA moments when I always wonder what took me so long to see the obvious. What if the “uncle” reference was literal? Of the two Jacob Summers in the area, the older man was the younger man's uncle! And interestingly, the references to “2d” did not appear in the records until after the death of Uncle Jake's brother, John Summers, Jr. in 1843. At that point, I believe, John Jr.'s son, Jacob, started calling himself '2d,' and others referred to his uncle, Uncle Jake, accordingly. Considering that John Summers Jr. married his wife Jane in 1807, Jacob 2d could easily have been their oldest child. So this theory holds some water, in my opinion, and while still not proof of anything, I like the utter simplicity of this conclusion: Uncle Jake Summers and his nephew, Jacob 2d were both early pioneers to Macomb County, Michigan. During their lifetimes, there was likely no confusion about the identity of either Jacob Summers or their relationship to each other. But over 150 years later, it takes awhile to collect the puzzle pieces, put them together, and step back to see the big picture! At last, I feel like I'm looking at a picture of two Jacob Summers in Macomb, Michigan that makes sense. First, I want to say that I've had a busy summer (!) of traveling and have much to post on the subject of Sommer in Philadelphia as well as Summers in Michigan. But I'm still sorting and analyzing, so the write-up(s) will come soon - stay tuned! In both cases, the bride was born in/abt 1823. Which one might have been the missing daughter of John? It took me awhile, but I finally realized that Caroline Summers was the daughter of William Summers and Rachel Hoagland. Mr. Proctor must have died soon after marriage because then in 1847, Caroline Proctor of Avon married Calvin Potter, and by 1860, Caroline was a widow (apparently) again. What's interesting is to note that Caroline was of Shelby Twp in 1842, and her witnesses, the McCracken's were of Avon (just across the county line). So that leaves Maria Summers. I believe she must have been the unaccounted-for daughter in the household of John Summers Jr. The witnesses to her marriage were of Sterling Twp. in Macomb. And then Maria must have died shortly after her marriage because on 25 Jan 1849, Francis R. Chapel married Freelove Covell. It does not appear that Maria had any children before she died, or if she did, the child probably did not survive. As often seems to happen in these times of internet genealogy, stories sometimes cross where details can easily get wrongly attributed to the wrong people/places. I believe a case in point is the Wandling family of early Sussex County, New Jersey. I am going to here add an overview of my research showing connections I believe to have existed between the Wandling and Menge/Mann families. 1. Most crowd-sourced trees seem to agree that the original immigrant to America was Jacobus Wandling born before 1740, and died in 1816 in Columbia County, PA, married to Anna Maria. But right away, there is disagreement about where Jacobus came from in Europe. Some say he was Dutch (original name spelled Van Der Lin), others say he came from the upper Rhine Vally in Germany. As far as I know, we don't have documentation that supports either case. 2. Combined crowd-sourced trees say that the children of Jacobus and Anna Maria were: Elizabeth, Henry, Adam, John, Mary Catherine, and Jacob. Of the sons, Adam stayed on the family homestead in New Jersey while Henry, John, and Jacob migrated to Pennsylvania. 3. The oldest son, Henry, is of particular interest to me. The records of St. James Lutheran Church in Greenwich, NJ show a marriage between Henrich Wendling and Catarina Mange in 1788. But who was Catharina Mange, and who were their children? According to my research, Catharina Menge was born 12 Jan 1766 in Philadelphia to Ernst Mangen (original German spelling was something like Menge, and later in America MANN) and his first wife, Catharina Klockner, who subsequently died only weeks after her daughter was born. Ernst Menge quickly remarried to my 5th g-grandmother, Maria Magdalena Sommer, later in 1766. The Mann family moved from Philadelphia to Sussex County, New Jersey around 1780. There Ernst's oldest child, Catharina, married Henry Wandling in 1788. 4. Ernst Menge wrote his will in 1804 where he bequeathed one-eighth of his estate to Jacob and Mary Vandolin. This bequest was confusing for the longest time because Ernst's daughter Mary was already named in the will as the wife of Andrew Banghart. But then I found New Jersey deeds and orphan's court records that were filed after Ernest Mann died in 1816. Those records refer to Jacob and Mary Vandolin as heirs-at-law, children of Ernest's deceased daughter Catharine. At this point, I realized that Jacob and Mary Vandolin were not a married couple, nor were they children of Ernst Mann, but rather they were his grandchildren by way of his daughter, Catherine, who was born of Ernst's first marriage and who later married Henry Wandling. Because Ernst's will was written in 1804, we must assume that his daughter, Catherine Menge Wandling, died some time before that date. 5. There is some evidence that Henry Wandling/Vandling, who had likely moved to Northumberland County in PA, might have married again around 1810 to Elizabeth or Sarah Follmer, who also must have died prematurely. Orphan's Court records there in 1826 indicate that somebody named Henry Vandling requested that the court appoint a guardian for his children Abraham and Henry Vandling, who were also legatees in the will of George Follmer. It seems likely that Elizabeth Follmer, named as daughter of George Follmer, died before 1820 and her only children were Abraham and Henry Vandling. I have yet to see any conclusive documentation that tells us whatever became of Henry Wandling. 6. Let us now return to the children of Henry Wandling and Catharina Menge, namely Jacob, born 1790 and Mary, born 1791. It was this Jacob Wandling who married Keziah Meyers and died in Morgan County, Ohio in 1847. Mary Wandling married Andrew Seydel and died in Crawford County, Ohio in 1848. All the descendants of these two Wandling families also have roots in the Menge/Mann family of Södel, Germany! 7. The only point that still has me somewhat puzzled is that some family trees state that the brother of Henry Wandling, namely Jacob Wandling, born about 1766 and died 1847 in Chillisquaque, Lycoming, PA, married somebody named Mary Mann. Additionally, in the New Jersey deed records transferring shares of the estate of Ernst Menge in 1819 to Benjamin Hunt, TWO Wandling couples transferred their shares: Jacob Wandling and wife Keziah (son of Henry Wandling and Catharina Menge) and Jacob Wandling and wife Mary. Who is this latter couple? I have not seen this deed myself, but it could be that the transcriber made the same mistake I did when looking at Ernest Mann's will, assuming that Jacob and Mary Vandolin were a married couple. So if the wording does not actually say "Jacob and wife Mary" but rather "Jacob and Mary", then we are still talking about two siblings who were grandchildren of Ernest Mann. I will look this up next time in SLC, so stay tuned. 8. As a final note and aside, a different branch in my family tree includes other names from Sussex County, New Jersey, including the name TAYLOR. In 1791, Jeronemus Taylor wrote his will in Sussex County and named his friend, Jacob Wandling, as one of the executors! Curious, right? As usual, I hope this information is helpful to other researchers and I welcome any comments. I'm seeing more and more family trees where there is great mixing of different Sommer's families. I wish there was an official place to register our family lines so this mixing-up wouldn't happen because I think the mixing-up is a damaging thing to all of us. Sigh. All I can do is try to share my research and perspective and hope that other serious researchers will care as much as I do about getting it right. Let's put our heads together and see if we can untangle things! Meanwhile, here's an article I wrote with more specifics about the particular question of which Jacob Sommer descended from Freistett, Germany and lived in colonial Philadelphia - Jacob, the Judge, 1758-1827, or Jacob, the Carriage-Maker, 1749-1817? Update: As it turns out, both of the Jacob Sommer's mentioned here lived in the Philadelphia area and both served in the Revolution. Jacob Sommer of Germantown was the carriage maker, and Jacob Sommer of Moreland was the one taken prisoner by the British, and who later served as PA State Senator. See my article Jacob Sommer of Moreland PA in the American Revolution, as well as the later footnote added to this blog about Jacob Sommer of Moreland.